The Swarming Sheargrub (ブリコ?) 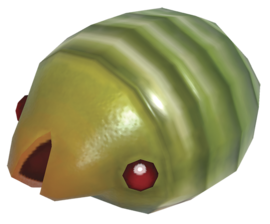 is a green Sheargrub with red eyes found in Pikmin 3. It, in every way excluding size and color, resembles a Female Sheargrub. Swarming Sheargrubs are known to follow Pikmin from a distance and can distract an entire squad as a result. They move around in swarms at high speed (fastest of any known mandiblard). They have no form of offense but can move quickly, taking any attacking Pikmin with them. Once they come across any nectar, they will consume it and grow in size. They can also hide under plants, like Pikmin. Most swarms come in groups of seven. When they spot a salvageable object – such as a fruit, pellet, Victory Macaroon, or carcass – they will jump and sit on top of it, weighing it down and thus, making it require more Pikmin to carry. The larger they are, the more they will weigh. While they are an annoying hindrance to the player, they are easily defeated like any other type of mandiblard. However, once a single member of a swarm is harmed, the rest will disperse and run away at very high speeds. It's advised to call all Pikmin back at this point, as they will attempt to chase the fleeing Sheargrubs, only to end up getting themselves lost. Swarming Sheargrubs will always spawn above the ground where the Lesser Mock Bottom is located. The best strategy is to throw some non Winged Pikmin and you should get at least 3 of them. Wait for them to come back and get them again. In Tropical Wilds Remix, let the Baldy Long legs kill some for you. These Sheargrubs are distinguished by the rest with the word "Swarming", because they move in a swarm. In Japan, they're known as ブリコ?, which is the name given to the roe of the Japanese sandfish, since fish roe is typically a large group of eggs, not entirely unlike the Swarming Sheargrubs. Internally, it shares its data with the Female Sheargrub, so its internal name is ujinko_a, but when it needs to be disambiguated from the Female Sheargrub, it uses the name ujinko_c. Close up of a Swarming Sheargrub. Swarming Sheargrubs weighing down a Scaly Custard. Pikmin carrying a Velvety Dreamdrop infested with Swarming Sheargrubs. A group of Swarming Sheargrubs in Tropical Wilds. Swarming Sheargrubs drinking nectar, notice the size difference between them. Big Swarming Sheargrubs weighing down a fruit. A swarm weighing down a Velvety Dreamdrop, as shown by the carrying numbers. These are the only known enemies that can increase in size by consuming an item. When a Swarming Sheargrub gets on top of an object or drinks nectar, a munching sound can be heard. In the April 17th, 2013 Nintendo Direct footage that revealed Winged Pikmin, Swarming Sheargrub sound effects can be heard in the Twilight River, suggesting that they were originally going to appear in that area. This page was last edited on March 16, 2019, at 12:30.